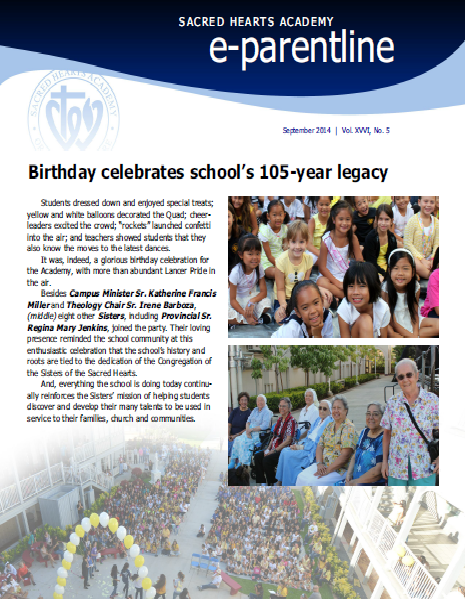 Sacred Hearts Academy - The Blog: Sacred Hearts Academy Celebrates 105th Birthday! On Friday, September 12, 2014, Sacred Hearts Academy celebrated its 105th Birthday! Student Council helped coordinate the morning celebration which took place in the courtyard. There was a dance-off between student representatives and teachers, resulting in a win for the students. Festive confetti launchers, balloons and cupcakes were all a part of the party. Students dressed down and enjoyed special treats;yellow and white balloons decorated the Quad; cheerleaders excited the crowd; “rockets” launched confetti into the air; and teachers showed students that they also know the moves to the latest dances. It was, indeed, a glorious birthday celebration forthe Academy, with more than abundant Lancer Pride in the air. Besides Campus Minister Sr. Katherine Francis Miller and Theology Chair Sr. Irene Barboza, (middle) eight other Sisters, including Provincial Sr.Regina Mary Jenkins, joined the party. Their loving presence reminded the school community at this enthusiastic celebration that the school’s history and roots are tied to the dedication of the Congregation of the Sisters of the Sacred Hearts. And, everything the school is doing today continually reinforces the Sisters’ mission of helping students discover and develop their many talents to be used in service to their families, church and communities. Take a look through the photo album on Facebook [Link]. Post by Sacred Hearts Academy.